I don’t think I can adequately put into words the magic that happened at Partners tonight. Exhausted by the long haul north on busy freeways and disheartened by the loss of our darling truck Willie Nelson, it was a sorry bunch who arrived at the Comfort Inn in North Bay this afternoon. Not even the air conditioning or operational stereo of the Subaru could cheer us up. We were so long-faced we didn’t even want to eat dinner — but we managed a quick trip to Wendy’s anyway, just this once. When karaoke time rolled around, I think we were all a little more inclined to keep napping instead, but we rallied and clambered into the Subaru to head for the bright lights of downtown North Bay, and the inimitable Partners Billiards and Bowling. 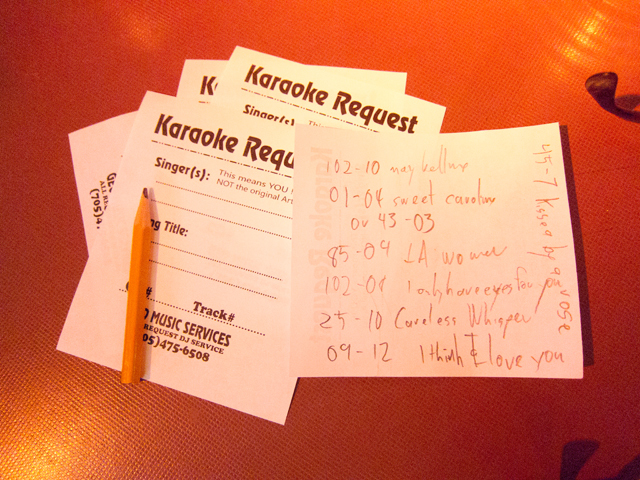 Every Friday at 9pm, DJ Geo warms up the microphone for a night of all-request Karaoke hits. Our waitress Tanya said that most nights it’s packed by 11pm and late-comers don’t get to sing, but because of the big weekend party at Mattawa Voyageur Days, it was a little quieter. There was a rotating roster of about six crooners when we arrived: Fern, with his off-kilter country classics, Vince and his golden voice, Georges Sr and Jr, and the boisterous ladies Tina and Tammy with their rollicking renditions of the hits of revenge and betrayal, and most of Madonna’s mid-80s catalogue. The disco ball sent slivers of blue and orange light shimmying across the floor and the crack of the pool rack breaking across the felt tables gave the place an air of bustle even in its relative emptiness. Mike started off with a comparatively lacklustre Sweet Caroline to a lukewarm crowd response, and we were a little concerned about the evening’s direction, but then Alexe really warmed them up with her sparkling dance moves to Willie Nelson’s On the Road Again. After that, the UNORTs were on fire. The crowd-pleasing harmonies of the Beach Boys’ Barbara Ann got the dance floor jumping, Alexe’s rendition of Mitsou’s French pop classic Bye Bye Mon Cowboy brought out the provocative questions, and when Mike channeled Elvis with the heartbreaking Love Me there wasn’t a dry eye in the house. We even joined the dance-circle with a little fancy two stepping before making a break for it at last call, when the young turks took to the stage with contemporary pop-punk compositions. We stopped in at the Metro supermarket on the way home to appease our re-awakened appetites, and nibbled on microwaved Pizza Pockets in the comfort of our hotel room while watching footage of ourselves slay the microphone on Bogdan’s computer. Tomorrow — More hot times with Rock and Roll at Mattawa Voyageur Days!